Not content with exploring your own world? There are plenty other places to go... if you dare! Publisher's blurb: "The most powerful adventurers know that great rewards - and great perils - await them beyond the world they call home. From the depths of Hell to the heights of Mount Celestia, from the clockwork world of Mechanus to the swirling chaos of Limbo, these strange and terrifying dimensions provide new challenges to adventurers who travel there. 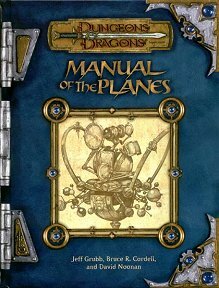 Manual of the Planes is your guidebook on a tour of the multiverse. "This supplement for the D&D game provides everything you need to know before you visit other planes of existence. Included are new prestige classes, spells, monsters, and magic items. Along with descriptions of dozens of new dimensions, Manual of the Planes includes rules for creating your own planes."